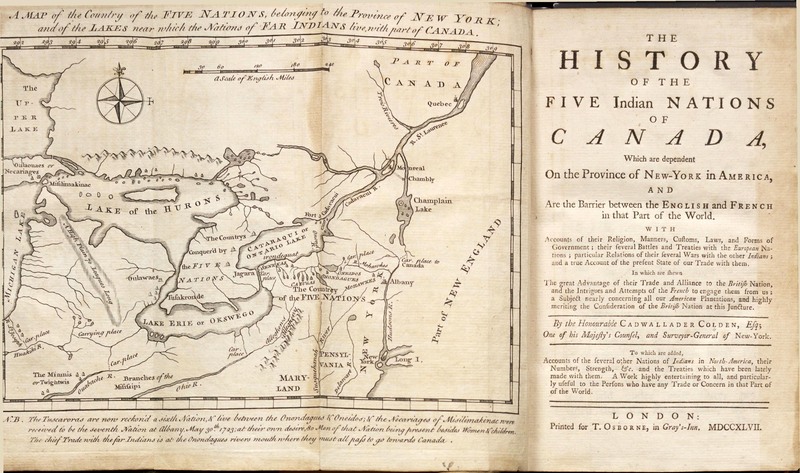 Cadwallader Colden’s The history of the Five Indian Nations depending on the Province of New-York in America was first published in 1727 and is an important work of history from the colonial period. Colden was a physician, natural scientist, lieutenant governor of New York, and the first representative to Iroquois Confederacy. He was born in 1688 in Scotland and made his way to America in 1710. He wrote essays on the filth of New York City, philosophy, and botany, as well as this important work. The Watkinson’s copy of The history of the Five Indian Nations was published in London in 1747, which one editor claimed had, “alterations and omissions so numerous , that students to whom these English editions are familiar have really no idea of what the work was as originally written by Colden”. He also notes that George Brinley of Hartford, owned a copy of the original press run. Although the Watkinson owns a portion of his collection, this original copy is not included. 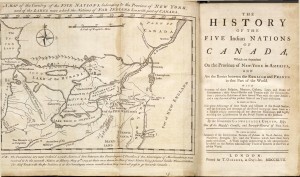 The book includes a fold-out map; a dedication; detailed introduction (“being a short view of the form of government of the five nations”); a vocabulary of tribal names; and chapters like, Of the Transactions of the Indians of the Five Nations with the neighbouring English colonies and Mons. De la Barres Expedition and some remarkable transactions in 1684. The map is fairly detailed and shows the tribes of the New York and Great Lakes region. If you focus on the New York section above “The Countrey of the Five Nations”, you will see each of the five nations spelled out in their territory. If you look closer still, you will see a small building drawn near each. These are what were known to the English as “castles”. In Little Falls, NY, where I grew up, there was a place called Indian Castle Church. It never occurred to me that it was a weird name, or that it had history behind it. “Indian Castle in Danube was so named from the upper Indian castle or fort, built in 1710 on the flat just below the mouth of Nowadaga creek.” -New York State Museum Bulletin, November 1917. This castle is located above the ‘s’ in Mohawkes. Each one of the five nations had a castle. In addition, the dedication alone offers an in-depth look into the politics of the times. Dedicated to “The Honorable General Oglethorpe”, Colden writes, “If care were taken to plant and cultivate [the Iroquois]… they would become a people whose friendship might add honour to the British nation”. In a time before the American Revolution, he clearly believes that the strength of the Iroquois should be harvested to fight (at the time) the French. Later, the Mohawk, Seneca, Onondaga, and Cayuga nations would join the British in the Revolution, while the Oneidas and Tuscaroras (the sixth nation, added in 1723) would join the Americans. Later, he equates the Iroquois with the Romans, saying that to increase their strength as a confederation; they “encourage the People of other Nations to incorporate with them”. “The cruelty the Indians use in their wars… is deservedly indeed held in abhorrence: But whoever reads the history of the famed heroes (the Romans), will find them not much better in this respect.” This is a fairly balanced line for a 17th century writer. Colden continues with a “short view” of the Iroquois government and then part one, chapter one: From the first Knowledge the Christians had of the Five Nations, to the time of the happy revolution in Great Britain. (Note: Colden uses the word “rodinunchsiouni” as the Iroquois word for their nations. In English today, it is Haudenausaunee, people of the longhouse). He includes stories of warriors, hunting parties, and expeditions that, “may seem incredible to many” but show “how extreamly revengeful” the Iroquois were. Don’t forget that Colden equated them with the Romans. Much of the book is based on tales of the battles and skirmishes between the Five Nations, the French, the British, and other tribes. 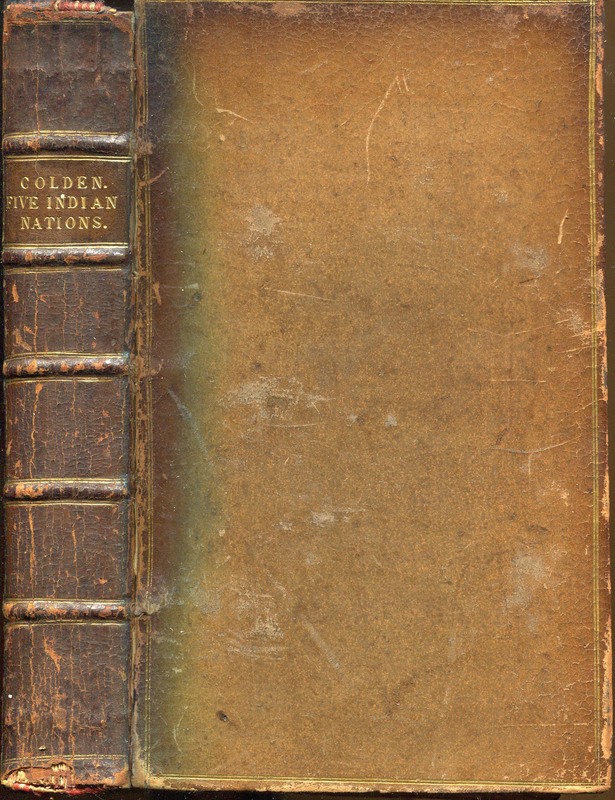 The final portion of the book stems from Colden’s political career: Papers relating to An Act of the Assembly of the Province of New York for Encouragement of the Indian Trade &c and for prohibiting the selling of Indian Goods to the French, viz. of Canada. An incredible lengthy, yet descriptive title. This is comprised of treaties, letters, speeches, and a list of the people who attended a council in Philadelphia in 1742. The spelling of the names of the Indians who were in attendance (from at least 7 different tribes) gives an incredible lesson on language and phonetics. Even today, the Iroquois languages are difficult to read (the pronunciation and the English alphabet aren’t completely compatible. It would be quite a project to sound out the names and try to glean meaning from them). Cadwallader Colden’s The History of the Five Indian Nations is still used today as a reference for historical books on the Iroquois. His attention to detail and (mostly) balanced writing make it one of the finest books on the topic. 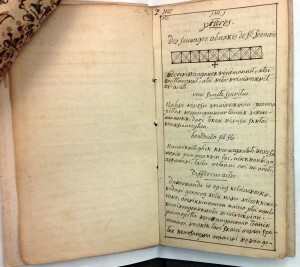 Housed in the American Indian Vocabulary Collection of the Watkinson Library are two manuscript prayer books from the eighteenth century, written in the Abenaki language. The prayer books are in the same hand, and on the inside of the front cover of one of them, we have a clue as to who the author might have been: “Father Germain, the last Jesuit missionary of the St. Francis.” Ordained in Belgium, Charles Germain decided to work as a missionary in New France. He lived among the Abenaki for twenty-nine years, from 1739 until his death in 1779. Germain lived through tumultuous times of a war-ravaged northeast that culminated with British dominion of North America following the Seven Years War (1754 – 1763). When Germain arrived in the Abenaki community in Acadia, the region was already under British control, as a consequence of the Treaty of Paris (1713) that ended the War of Spanish Succession. Germain was a military strategist as well as a missionary. He worked as a liaison between the government of New France and the Abenaki Indians under his pastoral care. His aim, like that of his predecessor, Sebastian Rale, was to consolidate Acadian resistance by ensuring that Franco-Catholicism left a lasting mark on North America. Committed to his faith and his country of origin, Germain’s proselytizing of Abenaki souls was intimately connected to his disdain for the Anglo-Protestantism. Language was Germain’s tool of both Abenaki conversion and war strategy. Speaking the language of the indigenous inhabitants of North America proficiently was the best means of communicating Christian doctrine and establishing alliances. Since the French presence in North American paled in comparison to the British, in terms of population and cosmopolitan development, the Indian-French alliance was France’s only hope of survival. Luckily for Germain, his Jesuit predecessors were accomplished linguists. Sebastian Rale lived among the Abenaki in Norridgewalk from 1691 until his death at the hands of the British in 1722. He composed an extensive dictionary that is now housed at the Houghton Library in Cambridge Massachusetts. For Rale, learning Abenaki was an incredibly difficult task. There were no books on the topic, no grammars, and no teachers other than the Abenaki themselves. Rale describes going to sit in Abenaki wigwams for eight to nine hours every day as “a child goes to school.” He spoke as best he could and the Abenaki corrected him. Because of Rale’s work, Father Germain entered a community with a fairly substantial written record of Abenaki. Indeed, we might even speculate that Germain developed his prayer books from Rale’s scribal publications of similar texts. Additionally, some of the Abenaki would have known French while others were used to playing the role of teacher to the Jesuit missionaries in an ironic process of role reversal where the European became the student and the American Indian the teacher. Scale is the most striking material difference between the Abenaki Prayer Books composed by Germain and Rale’s Abenaki Dictionary, or the monumental Illinois-French Dictionary compiled by Jacques Gravier and also housed at the Watkinson Library. Gravier’s dictionary contains over twenty-two thousand words listed alphabetically, with the Illinois preceding the French. The writing is small, economizing space in the enormous tome bound in marbled leather. Composed over decades, words were crossed out. Corrections were made, sometimes in Gravier’s hand and sometimes in a different hand, possibly that of his successors, Julien Binneteau and Gabriel Marest. By contrast, the Abenaki prayer books are small enough to fit in a missionary’s pocket. Composed of only about twenty leaves, they are sewn together with a thin piece of leather. The design ensures that the books function as useable texts in liturgical and ritual worship. The contents are equally succinct: morning prayers, evening prayers, the Ave Maria, the ten commandments, catechisms, confessional prayers, and psalms. Each title appears in French, as a clue to the priest leading the service, while the text itself is in Abenaki. It is likely that these prayer books were used by priests other than Germain. Such was the case with the Illinois prayer book written by Claude Allouez for Father Jacques Marquette to take on his travels along the Joliet trail. 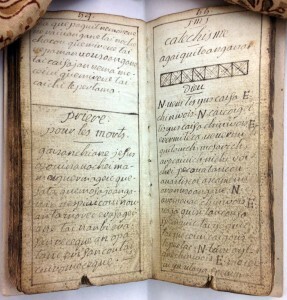 With the aid of such a prayer book, a priest could get by with minimal language skills. The prayers were mnemonic, sung within the context of a primarily oral indigenous language culture. Additionally, many of the Abenaki who had already converted to Catholicism lead the prayers during ritual worship, often more effectively than the priests who were bound by a partial understanding of both the language and the worldview that it represented. Germain entered into Abenaki territory with the goal of controlling the Abenaki people for imperial purposes. The Abenaki-French alliance during the Seven Years War is the dominant narrative that we associate with this time period. Yet texts such as these Abenaki prayer books suggest an alternative perspective, one in which language both facilitated French desire for indigenous dominance and undermined it. To learn the language, missionaries had to submit to instruction. They had to suspend their education and their linguistic training in Latin, Greek, and Hebrew in addition to several European languages. The indigenous languages of North America were nothing like they had ever encountered, nothing that they could have planned for upon leaving the Old World. To become proficient in Abenaki, Rale would assemble a group of native speakers whom he felt to be the most intelligent and eloquent. Before them, he would recite the catechism and hear their corrections. In doing so, he learned how different the language was from European languages, how delicate the mode of correct expression was. The massive dictionaries produced by Jesuit missionaries at the turn of the eighteenth century were attempts to visually capture the phonetic sounds of the spoken words around them. The catechism functioned as an educational text for native proselytes and missionaries alike. In some cases, this is all we have left of an otherwise lost language. As anyone who has studied a language other than his or her own mother tongue knows, language is a window into a worldview. Language gives us unique access to another culture. Something is always lost through translation, but in the case of the Abenaki prayer books, something was also gained. These texts became mnemonic tools for priests and proselytes alike. The form of translation reflected in the prayer books was cyclical, from oral to written and then back to oral. In learning the Abenaki language, the Jesuits also learned of Abenaki culture. And while Christianity was a tool of colonization, it also changed through translation. Doctrine, pious practice, and religious expression took on new resonance when expressed through words intended to represent an entirely different cosmos.